Did you know that the Netherlands has its own Venice? That’s right, Giethoorn has a car-free city center perfect to have a good time in the countryside. There are not a lot of things to do in Giethoorn besides enjoying the place and cruising in the canals, but don’t worry because you won’t get bored! Imagine a small town with very old and cute thatch-roof cottages along a canal full of sweet bridges and lots of nature. The Dutch architecture is undoubtedly fascinating, whether it is the modern architecture of Rotterdam or the traditional Amsterdam. However, the houses in Giethoorn look like they are straight out of a fairytale book and make this village one of the most beautiful places in the Netherlands. This is undoubtedly a perfect escape from the hustle and bustle of Amsterdam. Just relax and enjoy the town! 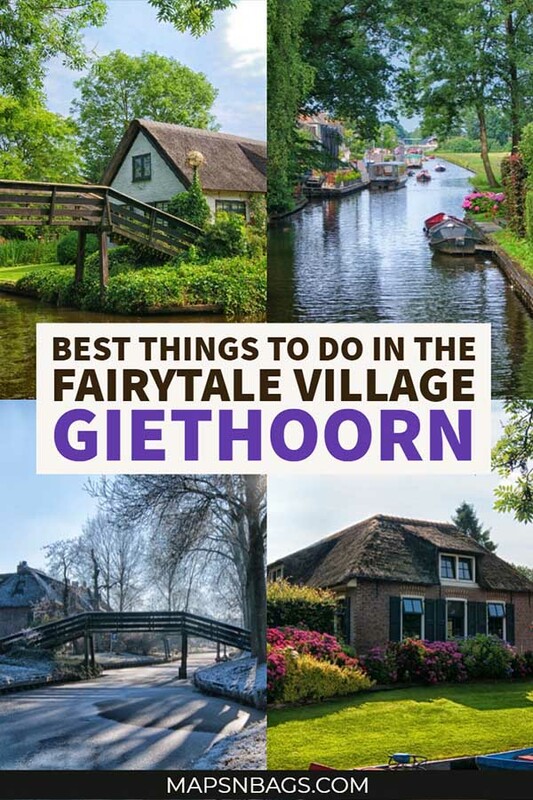 Since there is not much information on how to get to Giethoorn from Amsterdam, things to do in Giethoorn and other practical information, I decided to write this guide (including a map of Giethoorn) to help you with that based on my experience. Hope you enjoy the read! 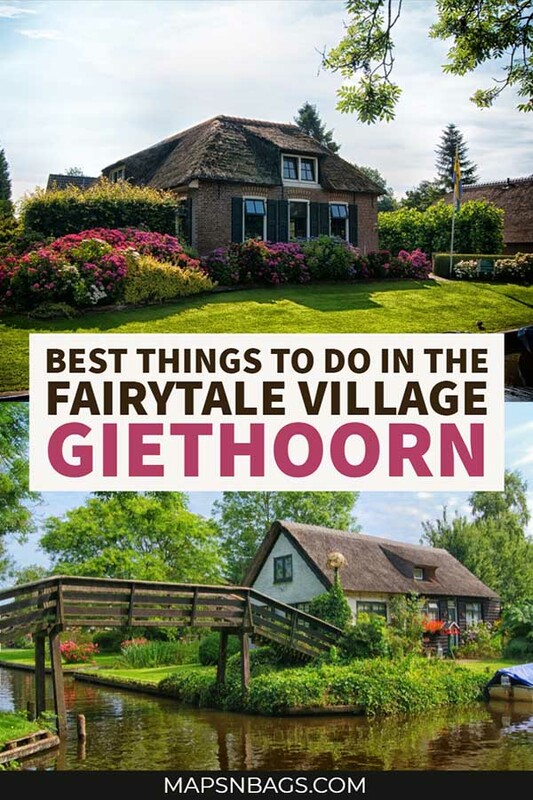 So, if you’re wondering what to do in Giethoorn, read on! But first, coffee and some history. Hey, looking for more tips for your next trip to the Netherlands? Check out some of our other posts below, or click here to find all of our Netherlands posts. Not Geithoorn, Giethorn, or Geithorn. None of those, but the village’s name is Giethoorn. I might be a bit difficult for non-Dutch speakers, I know. But there’s a meaning behind this name worth remembering. Many people ask me, “what does Giethoorn mean?”. Well, it means “goat’s horns.” The Dutch and English versions even look alike, right? Anyway, many goats died in the region, as a result of a flood in the 10th-century, and years later only their horns were to be found. That is a little sad, I know, but these are the facts behind this small town’s name. Sorry! Today the village has 2.620 inhabitants. Just so you can have an idea of how special this place is. Also, most houses are over 200 years old. Nevertheless, the cottages and their gardens look tidily organized. Dutch people are very proud of their adorable little town, which they kindly call “the Dutch Venice.” The Netherlands have been fighting against the water for a long time now since 26% of the country is below sea level. As a result of years of experience, they found a way to get along with it. Giethoorn is an example of it. Among other Dutch cities, of course. But unlikely these other cities, Giethoorn has almost no streets, only canals. This small town developed itself around water, and today it is a beautiful attraction in the countryside. Don’t go to Giethoorn expecting a Venice vibe. The ambiance is different. They only call it the Venice of the North because of the lack of streets around the main canal. Is it true that there are no streets in Giethoorn? Well, not really. The city center only has canals and a bike path (called Binnenpad) where you can wander around. But the village is a bit bigger than that, and in those areas, you can just drive. However, the real charm of Giethoorn (at least for tourists) is in the center – which is a quite long canal – and believe me when I say it looks straight out a fairytale. It’s no exaggeration. Anyway, you can only explore the romantic area of this Dutch village by boat. Or bike, of course. After all, we are talking about the Netherlands. This small hidden town has a magical appeal, but don’t fool yourself. It’s a hidden village, but it is so tiny that it doesn’t need many tourists to get crowded. Pssst: By the way, this is the only bike path in the Netherlands you can walk on. But only there! This is one of the things you should never do in Amsterdam, for example. 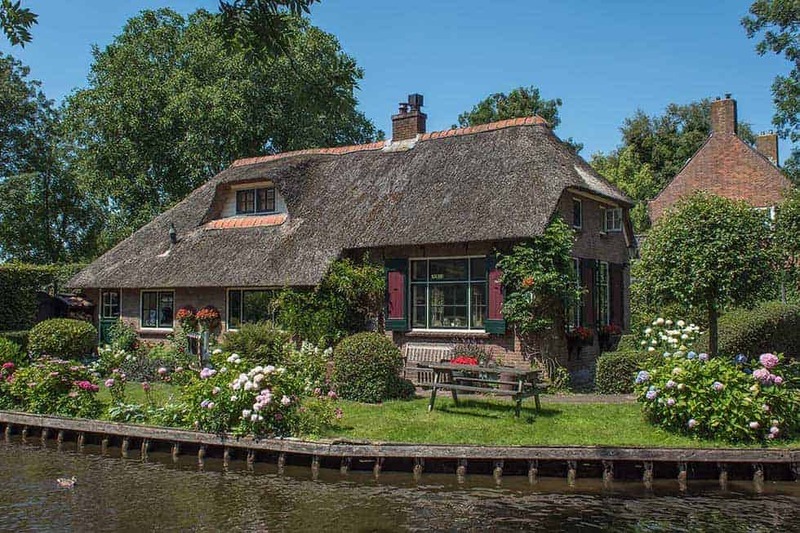 There are plenty of options for accommodation in Giethoorn and I’ll list some here. For budget travelers, I recommend the Black Sheep Hostel, right in the heart of the village. It has super good reviews and a simple – yet cool -decoration. For mid-range accommodations, you’re better off with a bed and breakfast, like the De Hofstee. The house has an intimate feeling and the rooms are spacious. If you’re looking for a charming luxe accommodation in Giethoorn, take a look at De Dames van De Jonge Hotel. The rooms have a traditional Dutch decoration, very sweet. Like I said above, Giethoorn is a perfect day trip from Amsterdam, and there are a few ways to reach the village. Considering that you’re leaving from Amsterdam, that’s a 1h30 drive, and Google Maps worked correctly suggesting the way there. You can easily park your car for free in Giethoorn. If you’re taking a tour, I recommend you park at the address they indicate because it’s more convenient for you. Otherwise, you could park at the Binnenpad 2, 8355 BP Giethoorn. My husband and I parked our car at the Cafe-Restaurant Smit since we were renting one of their boats. Ps: if you don’t have internet abroad, you might consider renting or buying a Wifi hotspot for your trips. Departing from Amsterdam Central Station take the train to Utrecht Central, then transfer to a train towards Leeuwarden and get off at the Steenwijk station. This is a 2h-train ride so far, but you aren’t there yet. Now take the bus 270 or 70 towards Giethoorn or Zwartsluis, respectively, next to the station (15 min only) and get off at the Dominee Hylkemaweg stop. Finally, walk down the street with the same name, and you’ll be in Giethoorn city center. Unfortunately, this isn’t the easiest way to get to Giethoorn, but if you follow these instructions, you should have no problem. Fares: The Netherlands has very high-quality and punctual trains (except when the weather gets terrible of course). However, it also reflects in its tariffs. A roundtrip from Amsterdam to Giethoorn by train costs around 44 euros – while the bus between Steenwijk station and Giethoorn costs around 5 euros for a round trip. Ouch! Pro tips: the bus goes more often in the summer months, but if you’re planning to go to Giethoorn in December or November, for example, you might have to wait a little longer. So, I highly suggest you download the 9292 app to know the bus’ timetables and plan your day trip. This is the official Dutch app for public transport. To know the train’s timetables, I suggest you download the NS app. You can set up both apps in English, and they show ticket prices, disruptions, everything you need to know to go to any Dutch cities by train. Alternatively, you can take a shuttle bus and guided tour in Giethoorn. 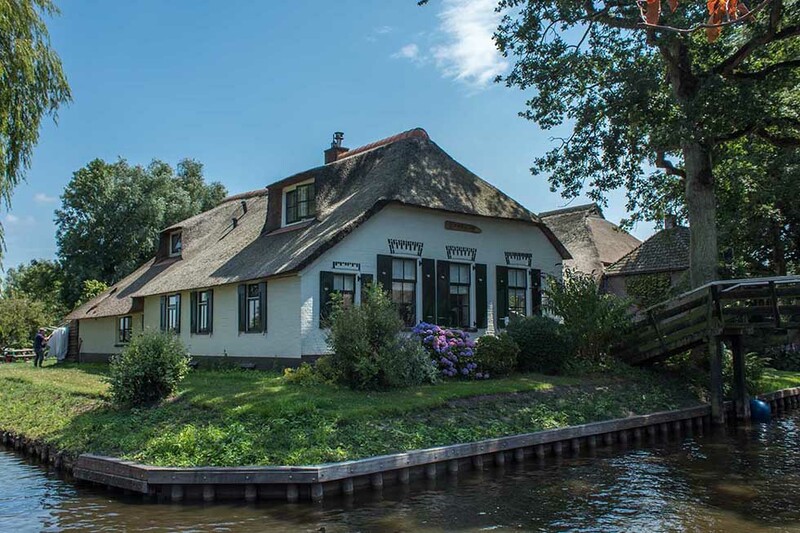 This is the most popular option to get to Giethoorn from Amsterdam because it is hassle-free and the bus/ shuttle departs from Amsterdam city center. 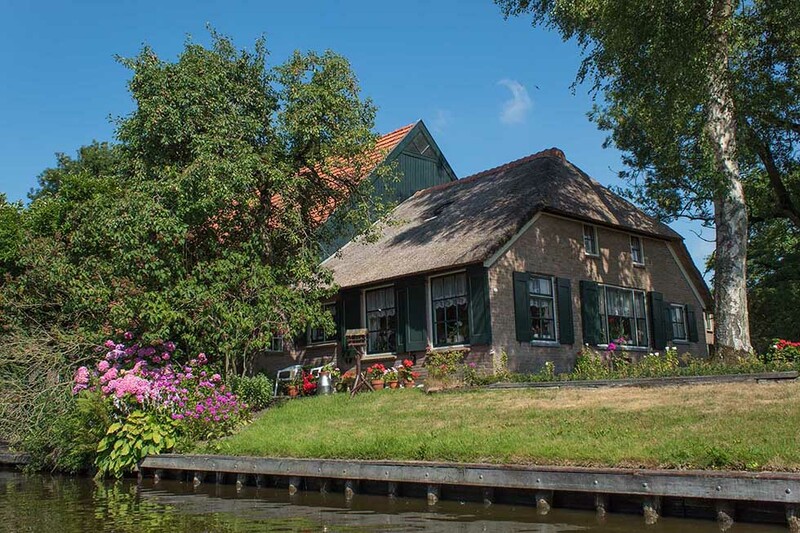 Once you’re in Giethoorn, you’ll have a 1-hour boat tour with a guide through the sweet canals. Don’t forget to spot the many extremely photogenic cottages from the boat. It’s a nice ride. That’s me dreaming of buying that house here! Isn’t it a fairytale village? Where can I start? The village has around 2k inhabitants just so you have an idea of how small it is. Therefore, one day in Giethoorn, the town with no roads, is enough to see and do everything. 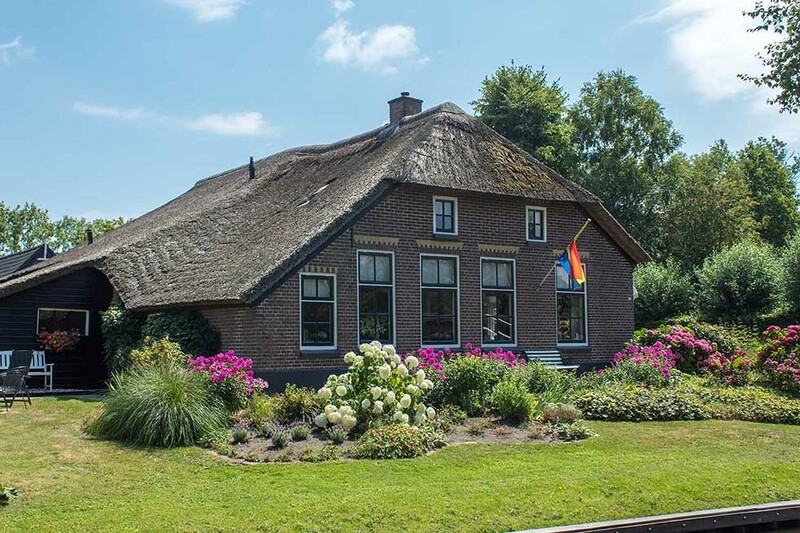 However, if you want to stay for a night – definitely a bucket list item for couples – and enjoy it a little more, I’ll give you later some options of places to stay in Giethoorn. They exhibit fossils, minerals and many interesting artifacts in this small family museum. Also, it’s the right place for kids because they have some excellent activities for them, like a treasure hunt. The gift shop is very famous among tourists, and you can try your luck by cracking a stone to try to find a crystal inside. A living museum showcasing a historic village with costumed actors. Yes, the employees are in traditional clothes! I don’t know about you, but I find this one of the most interesting things to do in Giethoorn. It’s so sweet! Anyway, enjoy your time while you learn about the history of the village in a very organized and documented exhibition. It wouldn’t be the Netherlands if you wouldn’t see bikes everywhere. So, why not go ride one yourself? There is one very long bike path along the main canal where you can bike and enjoy the fairytale and quiet view, but that’s also where people walk. Imagine you’re in Giethoorn on a Saturday afternoon in the Summer and you want to ride a bike there. Sorry, it’s not going to happen. So, I highly suggest you get up early to bike there, so you avoid the crowds like around 09-10 am, or earlier. Later in the day, it will be impossible given the number of tourists. Pay attention to the bridges you have to cross as they are as steep and narrow. This shop has many collections of shells and handcrafts, like Bijoux and decoration objects. Even if you’re not planning to buy anything, but just want to walk around, a stop by in this store can be fascinating. Needless to say, Giethoorn is one of the most romantic villages, not only in the Netherlands but also in Europe. Especially in the springtime, when all the flowers are blooming in the gardens. Couples can have a pleasant time here. Have something to eat in one of the restaurants by the water’s edge, stroll together along the canal while you both appreciate the place or take couples photos next to one of the many beautiful bridges. If you were looking for a romantic destination to spend Valentine’s Day, you have just found it. Not a single person I know who has been there wasn’t delighted by the beauty of it. Not one! Well, you have seen my photos throughout this post, so I assume I’ve convinced you to take many photographs of this place before you started reading this paragraph, right? Yaay! Prepare your camera! 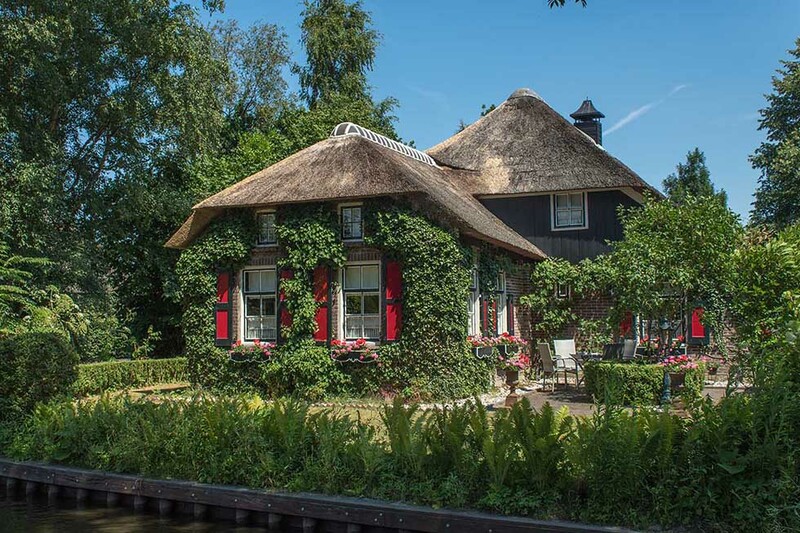 Giethoorn is a complete photography hotspot because of its sweet thatch-roof cottages. As a matter of fact, the whole “package” makes the village perfect for any photos you might want to take. The bridges, the flowers, the cows in the meadows, you name it. So start walking from Zuiderpad 21 until Binnenpad 25, this is a 2km (1,24 mi) walk. Trust me when I say you won’t regret visiting this breathtaking place. I probably took photos of all those houses along this path. Maybe you can even find some inspiration of angles and positions from these pics. Fun fact: Giethoorn was included in the new international Monopoly set, together with Amsterdam. I had never been in a whisper boat – or any other boat for that matter. We rented an electric boat in the morning, and the canal wasn’t crowded. It was a very pleasant cruising. We sailed the whole canal from the Cafe-Restaurant Smit to the half windmill, then went right to the big lake. There, we turned off the boat and chilled for a while. Ps: Boats hitting each other are a reality in the main canal because many people get confused when sailing, so watch out when raising your phone or camera to take a photo. If someone hits your boat hard, you might let it drop. There is a small island in the middle of the lake where people swim around and enjoy the sun. So if you’re heading there in the summer, take your swimming clothes with you! Pro tip: Even if you’re not going to swim, take a towel with you so you can put your feet in the water. It’s refreshing! Honestly, if the weather allows, this is the best thing you can do in Giethoorn! I updated this paragraph after a local asked me not to suggest picnicking along the main canal, as this is a great annoyance for locals. And I understand why! So, I still suggest you still picnic, but on an island in the Bovenwijde lake, easily reached by boat. Many people were sitting on the grass there and swimming around this island. Alternatively, you can also picnic on the boat. Just pay attention to the time, so you don’t have to pay extra. Pssst: Remember to leave nothing behind and to keep the area clean. If you don’t feel comfortable with the idea of cruising a boat yourself, you can hop on a guided boat tour across the main canal. Then the boat is a bit larger, covered, has proper chairs, and you go in a group, of course. I’ve seen many families and middle-aged tourists on those tours around the village, so if you’re looking for something hassle-free, this is the best option for you. Giethoorn is cute and pleasant during Spring and Summer. That is true. The flowers are blooming, the grass is greener than in other seasons, and the sun is probably shinning. Yes, probably (that’s the Netherlands, guys). However, even in the Winter months, the village has this magical appeal, and everything looks enchanting! So, yeah, Giethoorn in December is still a good day trip from Amsterdam. Besides the fact that you can ice skate on the frozen canals if the weather gets icy. Just wear a good coat (gloves and hat) and drink some hot chocolate to warm you up. 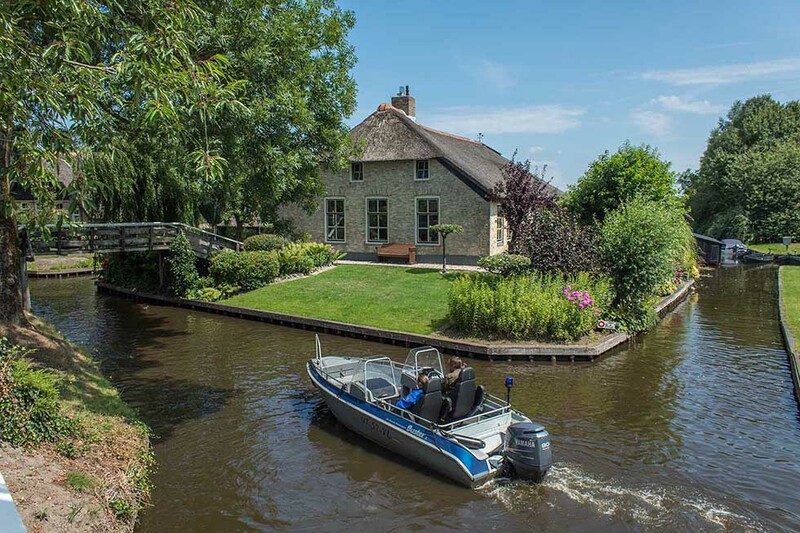 Pro tips: Heading to Giethoorn in the Spring or Summer? Then you should go there during the week as it gets easily crowded on the weekends. This is a popular destination among Chinese people, and they very often travel in large groups. I went on a boat ride at 10.30 am, and we didn’t find many boats in the canals, but later, around 1.00 pm, there was a real traffic jam! As a small and touristic town, there quite some options for restaurants by the water’s edge. We had a beer at the cozy Cafe-Restaurant Smit while some people were having lunch and it seemed very tasty. The Fratelli is a good option if you like Italian food. Hey, looking for more tips for your next trip in the Netherlands? Check out some of our other posts below, or click here to find all of our Netherlands posts. 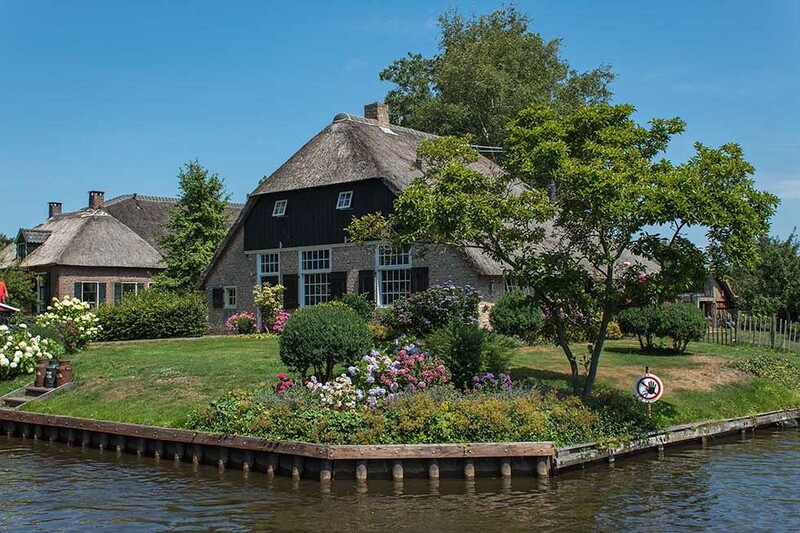 When are you headed to Giethoorn? What other villages have you been that were also straight out a fairytale book? Leave your answers in comments! I’m curious about it! This entry was posted in Netherlands and tagged Day trip, Fairy Tale, Romantic city. Me neither, to be honest! Thanks for this. Looks like a fairytale, bookmarking it for my future trip to Holland. Thanks, Mayuri! Glad you enjoyed!! I fell in love with this little Venice in the Netherlands. It is indeed a romantic village and an ideal weekend getaway. I would love to sit in a boat perhaps for hours. Thanks for sharing such a beautiful post. Thank you, Chirasree! Glad you enjoyed it! Beautiful, comprehensive post. 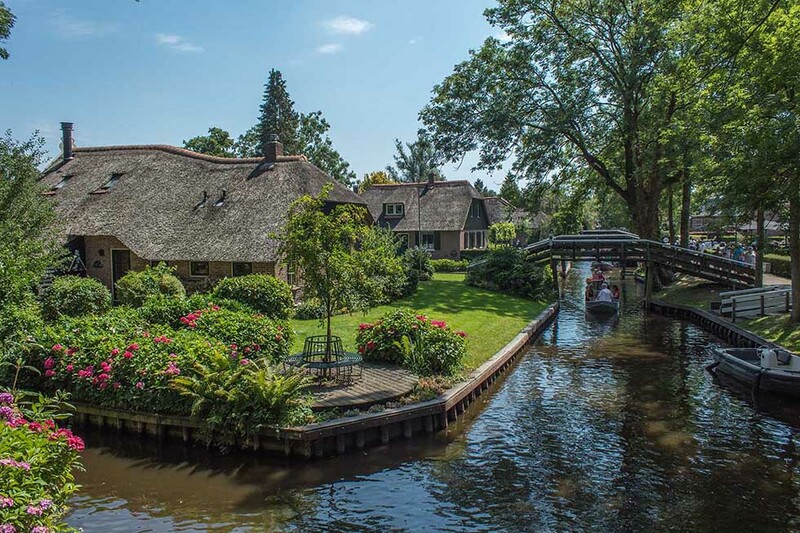 I’d never even heard of Giethoorn before and now I want to visit as soon as possible! You should! This village is REALLY a fairytale place! The homes look gorgeous Bruna. Over 200 years old? How inspired. I’d enjoy a trip to the Venice of Holland, especially with it being car free. Totally up my alley. Yes, they do! This is the most magical place I’ve ever been to! I’ve heard of this little town! It looks so magical! Reminds me a bit of Bruges. Wish I’d taken a day trip from Amsterdam when I was there last month! I pinned this for the future! Oh, that’s a shame! But Bruges is also an amazing place, isn’t it? Thanks for pinning it, I’m sure you’ll love it when you go there! OH! One of my favorite town in Netherlands! If my friends in Netherlands didn’t bring me here during my Europe trip, I wouln’t have known this lovely town. We went there during Summer, and it was crowded. All the boats are rented out. But, we were still lucky to have found 1 boat, probably the last one. 😀 This post remind me of my good memories in Netherlands. Hi Synz, nice to hear that you enjoyed it! I don’t know why, but there isn’t a lot of advertisement about this village. Yes, summers in the Netherlands are usually like that. The cities get crowded with tourists, especially Amsterdam and Rotterdam. Oh my goodness! This little town is dreamy! I’m afraid if I visited here I would never want to leave! Thank you so much for exposing me to a new place that was never on my list, but will be now!!! Hi Michelle, I’m so glad to hear that you love it! Please, go there! You won’t regret it. You’re very welcome. Glad you like it! I don’t mean cult in that meaning of the word, don’t worry. I know there aren’t religious or other kinds of cults in Den Haag. What I meant, is that this is a cultural city. Already changed it in the text, so other readers don’t get the wrong idea. This is so beautiful! I hope I can go there one day! Hi Liz, if you do, come back and tell me how it was! I’m sure you would love it! I’m so glad to hear it! I promise you won’t regret the visit! Giethoorn is stunning all year long! Thank you so much, Sapna! But it is so calm and special! I highly recommend to include in your plans when you come to the Netherlands! Wow Giethoorn looks beautiful. Almost everyone blogs about Amsterdam. I know Amsterdam is an amazing city but I am glad you choose to blog about another beautiful city in the Netherlands showing that there is much more to discover than Amsterdam. Hi Claudia! I’m glad you like it! Amsterdam will always be my favorite city, but there is so much to see in this small and lovely country! This village is a good example of it!